This report contains 2 major sections: industry’s“dynamic issues”and “trends of costs & prices”. 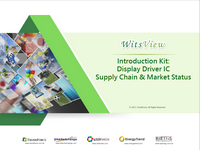 In the section of “industry’s dynamic issues”, it analyzes 2 or 3 key topics of driver IC and related supply chain. In “trends of cost and price”, it shows the factors that influence price trends and provides the price data of “driver IC”, upstream related “foundries”, and “packaging & testing”.